Patient presented with a large amount of excess skin on the upper eyelid. It visibly hangs on to her upper lash line. This is an ideal profile for the upper Blepharoplasty to remove the excess skin through the use of a specialised laser. This patient has had a fantastic result. The excess skin has all been removed and the patient has achieved a natural and rejuvenated appearance. Discover How an Eyelid Surgery Can Lead to a Rejuvenated Appearance! Patients who have browsed some of the before and after photos on the Dr Lanzer website have already noticed the dramatic results a blepharoplasty can deliver. The same applies to the patient in this case study, where the patient took advantage of a blepharoplasty to reduce visible signs of ageing. To learn more about case study 5, and blepharoplasty in general, please read the information provided by the Dr Lanzer Clinic below. Which Problems Were Presented by the Patient in Case Study 5? 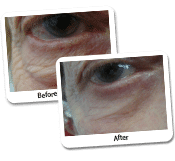 The patient in case study 5 presented a significant amount of excess skin on the upper eyelid; this made the upper eyelid visibly hang on the upper lash line. When comparing the upper eyelid and the lower eyelid of the patient in case study 5, it is clear that the problems of this patient are mainly focussed on the upper eyelid. Therefore, this patient was the appropriates candidate for excess skin removal of the upper eyelid. Which Facelift Treatment Did Dr Lanzer Correct the Problem? Dr Lanzer executed an upper blepharoplasty, which entailed the removal of excess skin via specialised laser. The patient in question obtained an amazing result from the procedure. The excess skin causing the aged appearance was completely removed and the patient maintained a natural yet rejuvenated appearance. The patient in case study 5 only had an upper blepharoplasty, which means that Dr Lanzer only had to perform the procedure on the upper eyelid. In other cases, Dr Lanzer needs to perform a blepharoplasty on both the upper and the lower eyelids. To see some examples of this procedure, please refer to other case studies that can be found on our website. 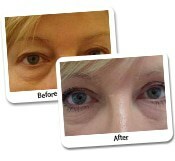 Can Eyelid Surgery Be an Alternative to the Brow Lift? Even though a brow lift can provide the patient with some rejuvenating effects, many patients want to avoid this procedure because of the “startled appearance” the procedure may cause. The brow lift can be compared to the traditional facelift, expect in the case of the brow lift, the procedure is executed on the forehead. To avoid the “startled appearance” many patients want to avoid, Dr Lanzer uses a modified version of the laser blepharoplasty. Thanks to this alternative facelift treatment, patients can still count on a rejuvenating appearance without the need for a brow lift or another facelift treatment. In conclusion, the most invasive facelift procedures are not always the best procedures, especially when you consider the individual needs and wishes of the patient. To obtain the aesthetic goals the patient has in mind, Dr Lanzer will always discuss the aesthetic goals the patient envisioned for themselves before any type of procedure is considered or executed. A blepharoplasty procedure focusses on the removal of excess skin and protruding fat that causes an aged appearance for the patient in question. The operation can be executed under a local anaesthetic or a general anaesthetic. Even though a local anaesthetic is more common for cosmetic procedures nowadays, the use of general anaesthetic is still a possibility if the surgeon estimates a procedure that will take a considerable amount of time. During a regular blepharoplasty procedure, the surgeon will make incisions in the natural creases of the eyelids. The natural creases of the eyelids are situated just below the lashes of the lower eyelids and in the creases of the upper eyelids. The incision is then made a little longer towards the corner of the eyes. Once the incision is of the appropriate size, the surgeon can remove excess fat, skin or sagging muscle. Patients who only have an excess amount of fat beneath the lower eyelid do not necessarily have to get an incision in the natural crease of the eye. 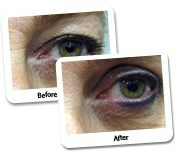 In this instance, the surgeon can remove the excess fat through the inside of the lower eyelid. 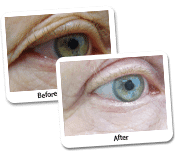 Unfortunately, this method cannot be used for the removal of excess skin on the lower eyelid. 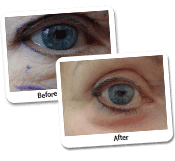 Can the Blepharoplasty Be Combined with a Non-Surgical Rejuvenation Treatment? In some cases, the cosmetic surgeon can combine a blepharoplasty with a non-surgical rejuvenation treatment, more specifically the laser skin resurfacing procedure. Laser skin resurfacing is executed by erbium laser and reduces the appearance of fine lines and wrinkles by eliminating certain layers of the skin. If laser skin resurfacing is used after blepharoplasty, the patient may experience some minor redness of the skin for a couple of weeks after the procedure. How Do I Care for My Eyes After the Procedure? After a blepharoplasty, it is essential to take good care of the eye region to speed up the recovery process. As a patient, there are several things you can do to promote the recovery process. Following the first couple of days after a blepharoplasty procedure, patients can promote their recovery by sleeping on an extra pillow at night. By keeping your head elevated while you sleep, it is possible to reduce the swelling that often accompanies the recovery process after a blepharoplasty. If swelling is bothering you during the day, patients can also use some cold compresses to keep the swelling down. In some cases, Dr Lanzer may recommend some eye drops or eye ointment after the procedure. 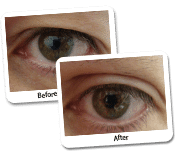 The eye drops will keep the eyes clean and greatly reduce the chance of infection. The ointment can also speed up your recovery. Most patients only experience some minor discomfort after their procedure, so there is often no need for pain management medication. However, if a patient should experience some pain after their treatment, they can easily manage it with some over-the-counter pain medication. In some cases, Dr Lanzer may prescribe something to manage the pain after the procedure. If you decide to take some over-the-counter medication during your recovery period, it is recommended to contact the Dr Lanzer Clinic before you take anything. Some medications can hinder the recovery process or cause complications, so always contact the medical team at the Dr Lanzer Clinic to ensure that the medication you want to take is safe for you to use.